In response to public demand and through the Playa Del Carmen Municipal Institute of Sport, the municipal government makes daily activities that promote physical activity and healthy living accessible to all residents of the City of Playa Del Carmen. In this respect, athletes from different ages are welcomed to engage recreational activities implemented by the mayor Filiberto Martínez. The engagement of the sporting culture is reinforced by the maintenance of sports facilities and formation of league play. Most noticeably to the citizens and visitors of Playa Del Carmen is the Inter Playa Stadium at street 34 and avenue 10. Users of this unit are supported by the municipal workers, who check the grounds, perform the maintenance, and keep track of the calendar for scheduling its resources. 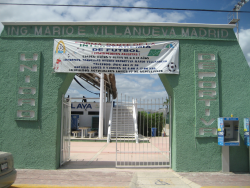 Mayor Filiberto Martinez Said “These worthy spaces allow the family unit and the welfare of children, youth, adults and seniors.” The work plan designed by the Institute to integrate the organization of leagues and tournaments that will increase citizen participation and take sport to all corners of the municipality.